The historical Masonic Hall sits on Broadway at the eastern entrance to the University of Western Australia. Works have begun on its restoration for use as a Graduate Innovation Hub and it is anticipated the project will be completed in February 2018. Convocation has accepted the role as a Foundation Sponsor with a contribution of $100,000 in 2017 recently approved by Convocation Council. 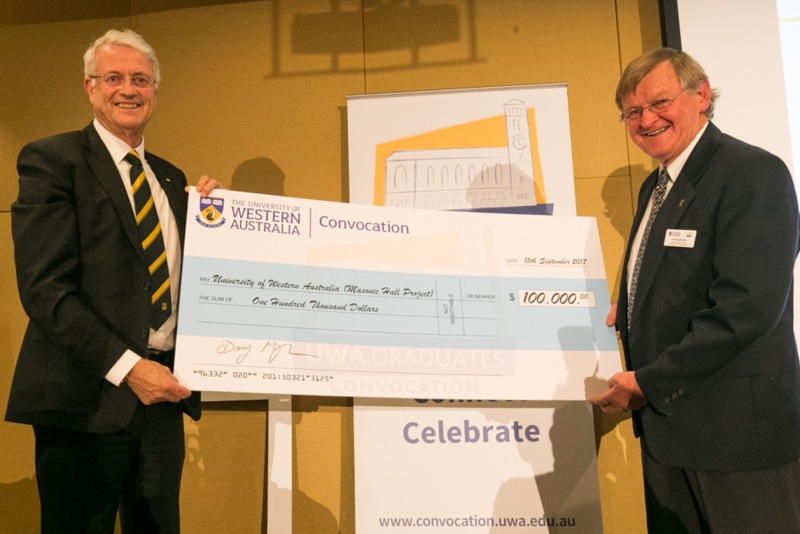 At the recent Spring Ordinary Meeting of Convocation the cheque for this amount was ceremonially presented to the Chancellor of the University, Dr Michael Chaney by Warden of Convocation, Dr Doug McGhie. Support by Convocation for this building project is in keeping with Convocation’s contributions to historical buildings and works of art at the University. Council was particularly impressed by the focus on graduate innovators and the enablement of their access to a new facility close to their University. Convocation will benefit through its profiling in the renovated building with internal and external signage, and through access to the facility for Convocation activities. Convocation is investigating the opportunity to hold the 2018 Convocation Day celebrations at the building, with a tree to be planted by the Guild President adjacent to the new Hub, on March 4th 2018 as one of the first functions at the building.